How many times can you put a cup of coffee in the microwave to reheat it? You sit down at the computer with a nice hot cup of coffee and before you know it, the coffee is cold because you got entranced with some great find and now the coffee needs reheating. The solution is to keep it warm to begin with by having a mug cozy on your cup of coffee. Personalize your mug cozy as a great gift. Mugs come in many sizes and shapes. This mug cozy can be custom-made to your measurements or adjusted for a "close" fit via the strap that goes through the handle. Two sizes are offered here. Rotary rulers are a great way to assure that you are drawing a truly square pattern piece. The body of the pattern piece is four inches by 18 inches. The tab–Measure 3/4 inches down on a four-inch edge, extend a line three inches out from the four-inch edge. Measure down 1 1/2 inches from the three-inch line and create a rectangle that forms the tab at the end of the pattern piece. This will wrap around the mug under the handle. The body of the pattern piece is 11 inches by three inches. The tab–Measure 3/4 inches down on a four-inch edge. Extend the line two inches from the three-inch edge. 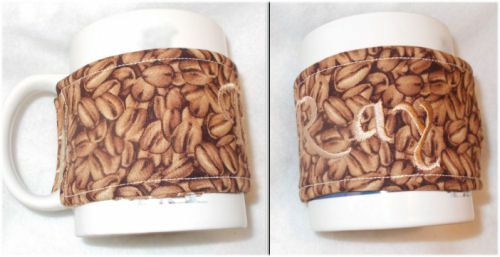 Measure down 1 1/4 inches from the two-inch line and create a rectangle that forms the tab at the end of the pattern piece This will wrap around the mug under the mug handle. For a smaller mug that measure 10 1/4 inches around and stands 3 3/4 inches tall, make the pattern the same as the medium size except make the body of the pattern 9 1/4 inches by three inches. Lay the pattern piece out using a long body side edge as a grainline. When cutting out the fabric, place the fabric right sides together so you will have two pieces that line up correctly later. Optional: Embroider the cozy by centering the design on the body of the cozy. Place two designs by folding the body in half lengthwise and finding the center of each half. On the back side of the fabric–along the end without the tab, sew the hook tape 1/2 inch from the edge, centered on the short edge. On the right side (front of the cozy)–sew the loop tape on the tab, centering it on the length of the tab. Place the right sides together of the two fabric pieces matching all of the edges. Lay the batting under the fabric and align the edges. Sew the edges together using a 1/4-inch seam allowance, leaving a three-inch opening in the bottom of the body of the fabric toward the end with the tab, to make it easier to turn the fabric right side out. Turn the fabric right sides out through the seam opening. Turn in the un-sewn seam allowance, pressing the seam allowance inside the cozy as if it were sewn. Press well so the seams are at the edges. Top stitch the entire edge, keeping the stitching an even distance from the edges. Note: Most batting requires stitching every so many inches (information found on packaging). To stabilize the batting and allow the cozy to be machine washable, sew a straight line halfway on the length of the cozy from long edge to long edge. If more stitching is needed, be creative and decorative.